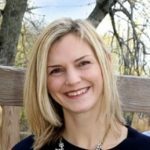 Mattingly, director of co-curriculum for the Riverdale School in New York City and co-teacher of the popular edX course, “The Science of Learning: What Every Teacher Should Know,” served as keynote speaker during the inaugural Site Director’s Meeting for Mastery Transcript Consortium on August 7 and 8, 2017, at Phillips Academy, in Andover, Mass. Seated at round tables and buzzing with ideas and questions, the audience included 60 enthusiastic site directors from 50 independent schools who were gathering in one room for the first time to start turning their ideas into reality. They were joined by staff and board members from MTC and Global Online Academy (GOA), which designed and facilitated the event. Eric Hudson, Director of Teaching and Learning at GOA, facilitated the meeting and led a number of working group discussions during the two days. One of the workshops, titled “Being Students,” engaged site directors in a design challenge: they had to imagine and pitch a brick and mortar café for Spotify. After presenting their pitches, each group gathered to reflect upon what skills they had exercised and what “evidence” they might submit if they were students demonstrating those skills. A site director has ongoing responsibility for preparing and guiding the faculty and school community in discussions, planning efforts, decision-making, and eventually in the transition to use of the Mastery Transcript if the school chooses to do so. 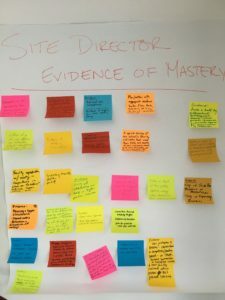 They also created sticky notes about what a mastery credit might look like related to their own work as site directors and what evidence would need to support that credit. Notes about potential evidence included, for example, receiving in survey results that demonstrated more than 50 percent of a school population is aware of the MTC, cohorts of teachers joining in the journey and clearly articulating their own teaching goals, and school leaders encouraging their faculty to explore the use of a Mastery Transcript. Other sessions included developing slides for online presentations to heads of school about the pedagogy that underlies the Mastery Transcript and what some of the next steps may be. They also discussed how to talk to various constituents within their school communities, based upon individual needs and goals. Ideas they came up with on how to connect with students, for instance, included “inviting students into conversation to write MTC criteria in small and large discussion groups” and reaching out to their families through small social events. With faculty and other school staff the possibilities centered on hosting lively discussions about topics such as the science of learning, workshops about change management, and various professional development opportunities. Shaping finer points, such as how schools can customize Mastery Credits based upon their own school culture while keeping the format consistent and readable to admissions officers in under two minutes. Mattingly noted that MTC is poised to be a game-changer, with great potential to transform the existing, 120-year-old paradigm of teaching, assessing, and crediting. The MTC currently has about 130 member schools signed on to the effort, with new members joining regularly. The next Site Director meetings will take place at Catlin Gabel in Portland, and Lake Forest Academy near Chicago, with additional meetings being planned throughout the year. Current Site Directors may request to be added to the MTC Facebook community. If your school is not currently a member but is interested in joining, please get in touch. For more information on MTC, please visit mastery.org.